I am thrilled that Miralee has taken the time to answer a few questions this week! Now, I am delighted to have her answer one final question! Blowing on Dandelions is currently available and Wishing on Buttercups releases in February 2014. Can you share a little sneak peek at Book 3 with us? I’d love to! You meet the heroine in Blowing on Dandelions, Leah Carlson, and the hero, Steven, in book two, Wishing on Buttercups. They have their own story in book three, Dreaming on Daisies. Here’s a short summary to whet your appetite….and it releases October of 2014. Feisty Leah Carlson has always loved her family’s ranch. But now she needs a miracle to save it … and to turn her pa around. Fiery redhead Leah Carlson didn’t expect at the tender age of fourteen to become caretaker and ranch foreman almost overnight. Empty promises, that’s all she ever got from her pa. Promises he’d change. Promises he’d do better. Promises he’d broken ever since Ma died nine years ago. And lately it had only gotten worse. At least the ranch was safe as long as she worked hard to pay the bills, unless Pa tried to use it as collateral for his drinking debts. But something needed to change. She had to find at least one hired hand—the sooner the better. Steven Harding never thought he’d be left in the dust emotionally when his mother reunited with his long-lost sister. To make things worse, the banking job in Baker City isn’t what he dreamed it would be, and he yearns for the simpler farm life he experienced as a young man. Then he meets the lovely, green-eyed Leah Carlson, who mistakes him for one of her father’s drinking cronies and gives him a dressing-down. Not long after, she steps into the bank to request a loan. Intrigued, Steven determines to help her, even when the bank refuses, but how? All he seems to do is irritate her. Still, he can’t shake the idea that he might not only be one of the surprising answers she needs to save her ranch … but to win her heart. Thank you so much for sharing that sneak peek, Miralee! I look forward to continuing this wonderful series!! Miralee has generously offered one copy of Blowing on Dandelions to be given away to one of my readers. Leave a comment, along with your email address, to be entered. This giveaway is open to U.S. residents only and ends Tuesday, October 29 at midnight CST. The winner will be drawn and contacted October 30. Good luck!! Thank-you for the sneak peek at the third book in this series…I am wondering if it is necessary to read the books in order? Thanks so much for your question and for following my blog. Each book stands alone but each also builds on the one before it. You meet the main characters in book two during book one, and understand so much more about them by reading it first. Same with book two/three. You can read them out of order, but would enjoy it more if you read them in order. I love the sneak peak of Dreaming on Daises. Another good one! A good book and a good author-what a combination! 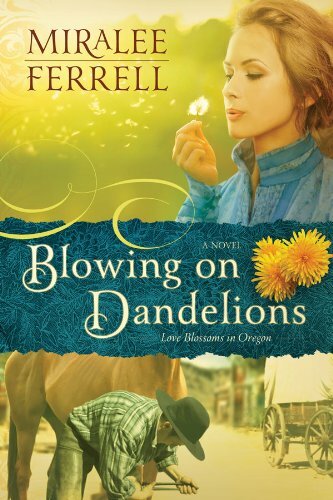 With Miralee Ferrell and Blowing on Dandelions you have that combination. Thank you Miralee for sharing your talents. Thank you Britney for keeping us posted about wonderful books. I am a follower of both of you and will definitely share the word through email. Thank you also for the opportunity to be a winner in the giveaway . Keeping my fingers crossed! Thank you so much for your comment and following my blog. I truly appreciate the sweet compliment on my books! I think Leah sounds like a really strong character and I would love to read about this. Sonja.nishimoto (at) gmail (dot) com. I follow your blog and I signed up for Miralee’s as well!. This sounds so interesting to me! Thanks for the opportunity! Thanks so much for your comment and the follow, Sonja! The book with Leah won’t release until October next year. Book 1, Blowing on Dandelions just released, book 2, Wishing on Buttercups releases Feb 1, and Dreaming on Daisies (Leah’s story) in Oct. You’ll want to read the first two prior to that, though. You don’t have to, but it would help a lot to truly know the characters and understand where they’ve come from. Book 3 sounds very interesting! Don’t bother to enter me into the giveaway as I already have the ebook. Thanks for stopping by! I hope you have a chance to read Blowing on Dandelions and enjoy it! Thanks so much, Titanic Buff (sorry, I don’t know your name!). I’m tickled you already have a copy. Yay!! I have an array of names when nicknames and pseudonyms are taken into account, Miralee, so need to apologize. 🙂 Yes Book 1 is next on my to-read agenda followed by Book 2. I look forward to diving in. Thanks so much, Susan! If you don’t win, I hope you’ll have a chance to get a copy. I appreciate you stopping by! I follow Meralee’s blog and like her author page on facebook. Thank you all so much for stopping by and commenting! Thank you, Miralee, for sharing your interview, sneak peek, and generous giveaway! It has been such a pleasure!! The contest will close at midnight tonight, CST. I will use Random.org to choose the winner tomorrow morning. The winner will be contacted via email and announced on the blog. Best of luck to all! Britney, I’ve enjoyed being here, thanks so much for having me and another huge thank you to each person who stopped to leave a comment.